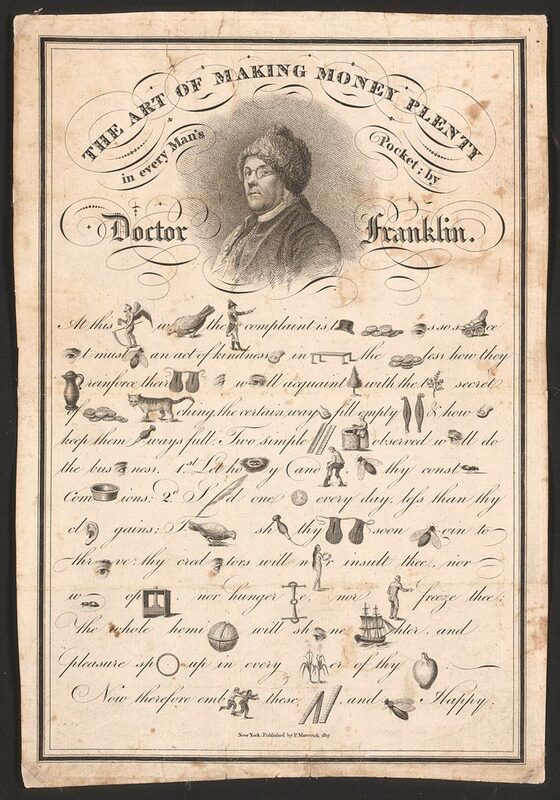 Dr. Ben Franklin, yes Benjamin Franklin, wrote a little piece called “The Art of Making Money Plenty in Everyman’s Pocket.” He was quite the jack of all trades, and knowledge. 2nd. Spend one penny every day less than thy clear gains. Then shall thy pockets soon begin to thrive, thy creditors will never insult thee, nor want oppress, nor hunger bite, nor nakedness freeze thee. The whole hemisphere will shine brighter, and pleasure spring up in every corner of thy heart. Now thereby embrace these rules and be Happy. The first picture is “time” (represented by Father Time). The third picture is “general” (represented by an Army General). Note: Several of the pictures are quite tricky, because the words they represent are no longer in common usage. For example, the third line shows two pictures of trees: the first is a “yew” tree (which stands for the word “you”), and the second is a “rue” tree (which, combined with the letter “t” makes the word “true”). i have a copy of this print.it was found in an old barn.has water damage. would like to know where i can find a copy of this.can anyone help me w/info. thnx. I found mine at Goodwill. It’s intact with the nice drawn edge. My problem is that I want to now more about it. I have,The Art Of Making Money Plenty it look very old.It has a number 5 on the Back can you tell me if its original an how many where made . Some 20 yrs ago my son found this picture in the trash. Does anyone know anything bout this picture? Its printed on some kind of board. Anyone know wat its worth? Went to the Flea Market today. The dimensions of my copy are 12″x 16″. It is in an old wooden frame but it has certainly had its better days. Am I rich ?